One never knows do one? Doing a hasty map recon of Arkansas Highway 293 north of the junction of Arkansas 277, I found a county road which led to Pickens, Arkansas. 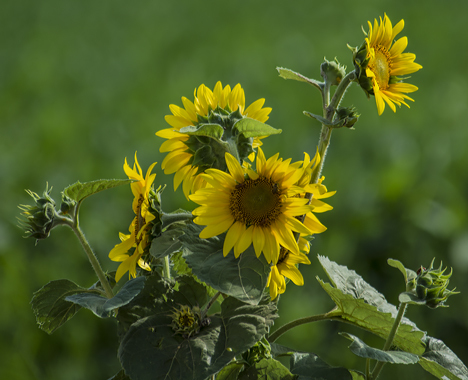 Rolling the dice, I turned on to the road and before long ran into a small roadside colony of sunflowers. I suspect they are the remnants of a commercial crop from years back. I did not see the airborne bee until I opened the picture in my computer. Some days you just get lucky. The immortal Fats Waller (1904-1943), among other quotes and tunes, once said “One never knows do one?,” a quip which has become one of my favorite fallback choices with which to ruminate upon an unexpected materialization or thought. The quip also describes to a tee what the results will be on a random shooting trip through LA. Such was the case on June 28, 2014. 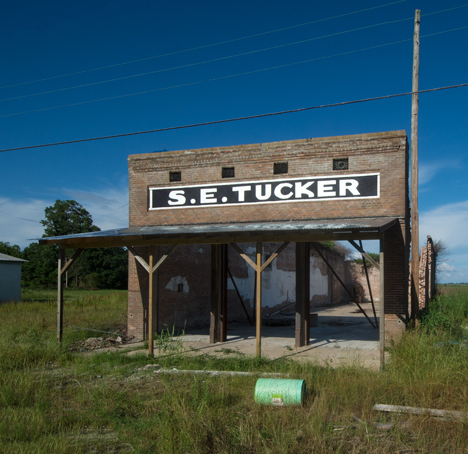 I re-shot an old friend, the now-closed store at the junction of Arkansas Highways 293 and 277 then proceeded north on 293 where I found a winding county road which connected eastward to Pickens, Arkansas. I figured I would find ample publication fodder on the road. I was right. I found an old farm house in a cotton patch. See our discovery of the old farm house on the Photo of the Week page at Corndancer dot-com. What could be more Delta? We’ll wait here while you look. 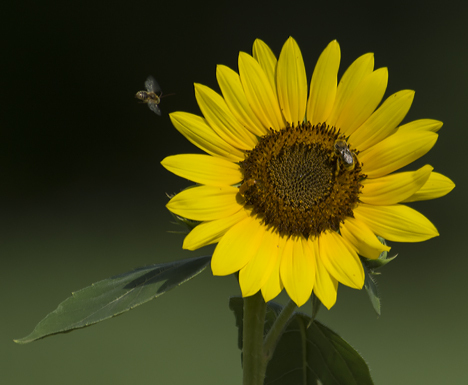 Before happening across the house, I found sunflowers and noticed that each plant was like its own little community, with the residents twisting and turning to have better access to the sun. There were flowers on both sides of the road so some were front lit and some were back lit. 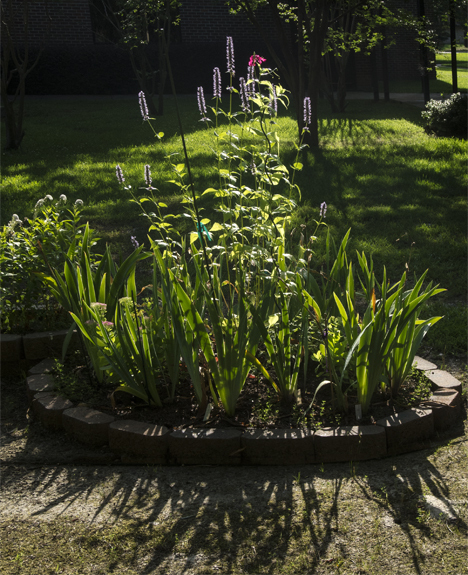 This is a wider view of the plant which is home to the large flower above. It is front lit (the sun over my back) which gives it a yellowish tint. It looks like the bee that was entering the picture above had made a bee-line to the other side, but don’t you believe it. I shot the pictures several minutes apart. This is the family across the road. It has strong back lighting (light source facing the camera) which yields the light green look. Proceeding eastward to Pickens, I drove through a nice bean field which showed an interloper in the otherwise exclusive neighborhood, to wit: corn. 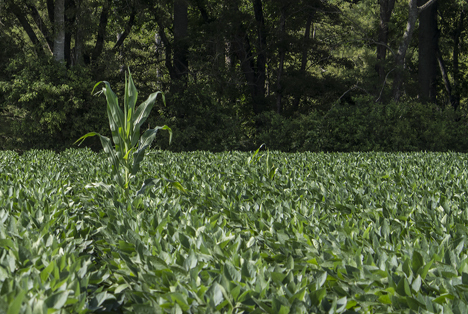 The corn was no doubt the leave-behind of a previous corn crop on the same field. The corn was rampant in the bean field which substantiates our suspicion that mother nature’s forces are far fiercer than ours. The seeds from which these cornstalks emanated were cut, bludgeoned to smithereens, slung asunder, smashed by a monstrous machine, and plowed under. But guess what, to a determined seed, no sweat! Remember the backlit sunflower? Here it is in the windy aftermath of a big thunderstorm. Once I arrived at Pickens, I headed to Dumas to grab a big ol’ Coke float at Sonic. During the process, a humongous thunderstorm ripped through the area. 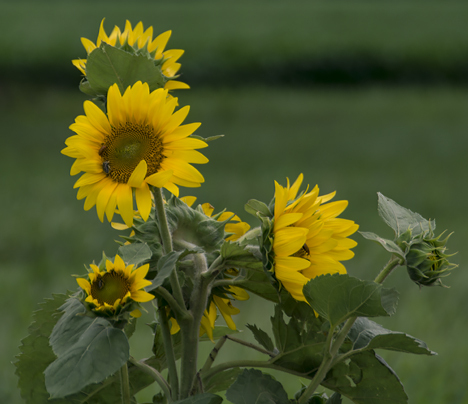 As I backtracked to Highway 293 to pick up where I left off, I passed the back lit sunflower in a stiff breeze under stormy skies. The bug on the big flower was still there. I guess it has the same tenaciousness as the corn seed. The day before, Friday June 27, Year-of-our-Lord 2014, back in town, in the courtyard of Grace Episcopal Church, Pine Bluff, Arkansas; Anyone who happened along about 6:00 p.m., and just happened to have a camera in his or her grubby little hands could have snapped this cool back lit bed of flowers. Back lit is always cool. Well, almost always. Click on the monument to see our original June 2010 post. The monument you see sits atop the initial survey point for the Louisiana Purchase made by President Thomas Jefferfson in 1803. The initial survey to establish that point was commissioned by President James Madison and completed in 1815. The surveyors marked the point by carving slashes on a couple of trees. The story goes dead after that, to crank up again in 1921, when two surveyors discovered the marks after they were hired by a couple of Arkansas County Judges to settle a boundary dispute. Here’s a wider view of the Louisiana Purchase monument. Click on the picture to see the full picture and read the story on the Photo of the Week page at Corndancer and find out how the initial point was forgotten and re-discovered — to settle a border dispute. Just goes to show you, a little controversy never hurts anyone. 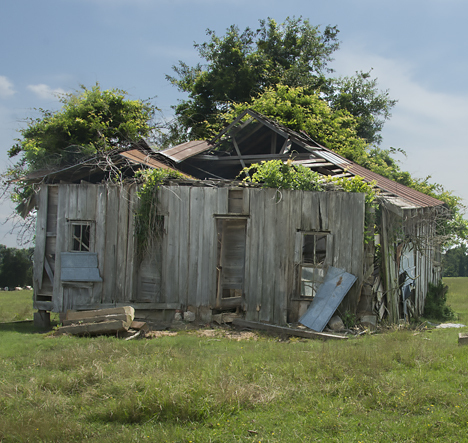 This old domicile in Cleveland County, Arkansas is not far from biting the dust. Seeing these old homes always makes me wonder what went on the last day it was occupied. Click on the father and daughter to see our pictures and story on The Bradley County Pink Tomato Festival. 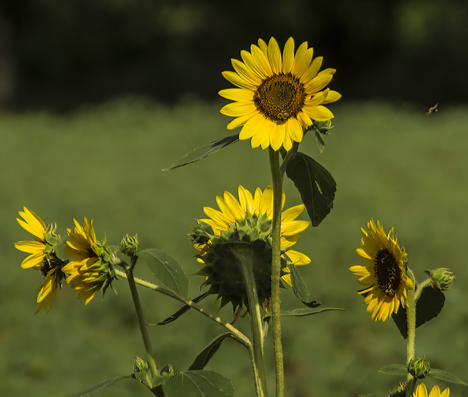 Returning home from a photo-trip to the Bradley County Pink Tomato Festival in Warren, Arkansas, I took some heretofore-unexplored-by-me back roads in Cleveland County, one of my best honey-holes for photo-discoveries. I found this old residence above, engaged in a losing battle with the inevitable forces of Mother Nature. Even though the structure is close to the collapse stage, the owner probably views demolition like one would consider execution versus dying a peaceful, natural death at an undetermined time. That aside, the Pink Tomato Festival, which precipitated this trip, was a hoot. See what I found there on the Photo of the Week page at Corndancer dot-com. We’ll wait here while you look. Here’s another angle which clearly demonstrates that Mother Nature now has the upper hand. 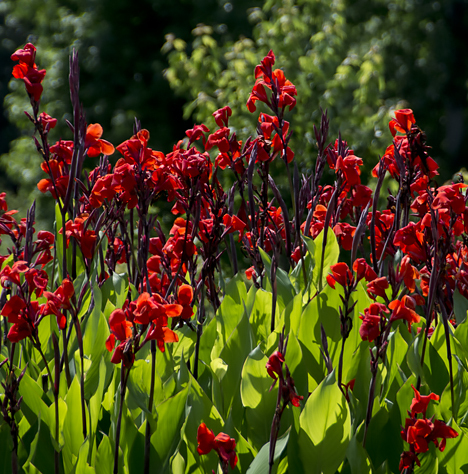 Not far from the old house, I found this bed of Cannas illuminated by brilliant afternoon sunlight — with just a tad of back lighting for effect. My childhood yard was ensconced with these suckas. 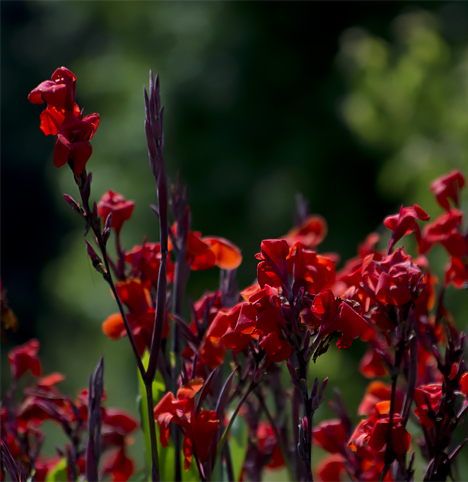 Here’s a longer lens look at the plant. The purple shoots are blooms on the way. This is a healthy bed. 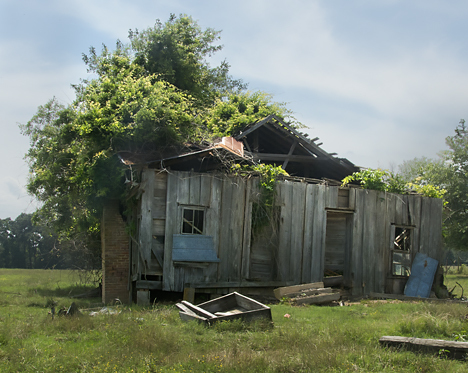 When I was nearly back to the “main road,” I ran across this, an all-too-familiar scene in rural areas. All that remains is that which was not combustible. From the looks of this fireplace and chimney, it is very old — from back in the bucket brigade days. Volunteer rural fire departments now dot the landscape and offer help when it is needed most in remote areas. Keep your eyes peeled for stuff most others don’t see. So will I — and I will report back next week. Be sure and see our 2014 Bradley County Pink Tomato Festival gallery with 47 pictures from the event. Suzanne Goulet, sings and dances her way across the stage of The Community Theatre in Pine Bluff, Arkansas in their show, Liza and Judy – Together Again. Denise Rose plays Judy Garland, Minelli’s mother. Click the pic to see pix of the theater interior and more show pictures. Big time entertainment came to LA this weekend. 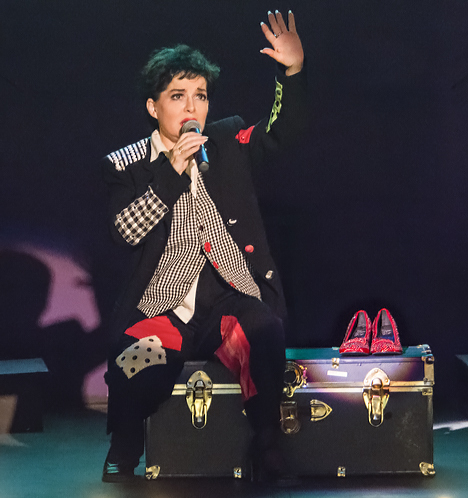 Suzanne Goulet as Liza Minelli, and Denise Rose as Judy Garland presented their show, Liza and Judy – Together Again, at The Community Theatre in Pine Bluff, Arkansas — fresh from Las Vegas. The theater premises is 125 years old. Jack Stradley and his wife Kathy Majeska recently completed restoration of the old structure — as closely as possible to its first configuration as a theater in 1922. The restoration did not come without its challenges. Get more information on the restoration and see interior theatre pictures as well as additional show pictures on the Photo of the Week page at Corndancer dot-com. We’ll wait here while you look. Somewhere over the Rainbow was an hit originally and still is. 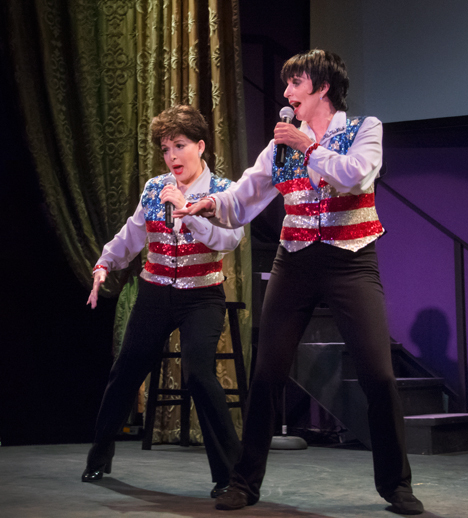 From left, Denise Rose as Judy Garland, and Suzanne Goulet as Liza Minelli are belting out a rousing rendition of Alexander’s Rag Time Band. I was quietly singing it with them as I photographed them. I suspect there were other interlopers in the audience equally as guilty as me in providing unsolicited choral accompaniment. Jack Stradley and Kathy Majewska wanted passers-by to not miss their restored theater. With this festive color scheme, they are getting their wish. Well, there you have it. Show-biz hits LA — and it is a good thing. We are grateful to Jack Stradley and Kathy Majewska for taking the bold steps to bring live theater to Lower Arkansas. Break-a-leg! We have also published galleries of previous 2014 Community Theatre shows. 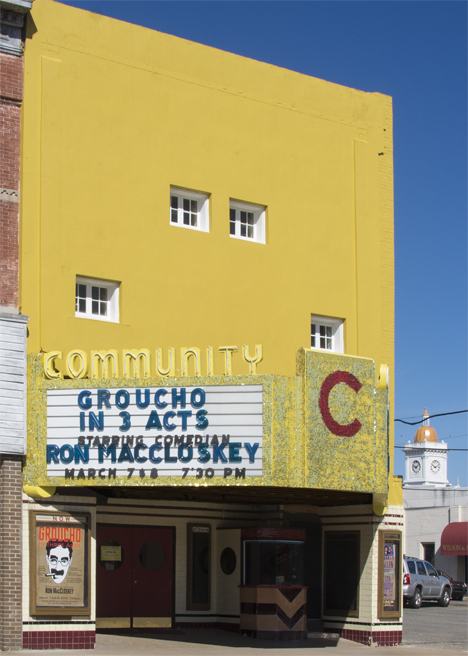 Go to http://pbcommunitytheatre.org and click on “Pictures” in the main menu. 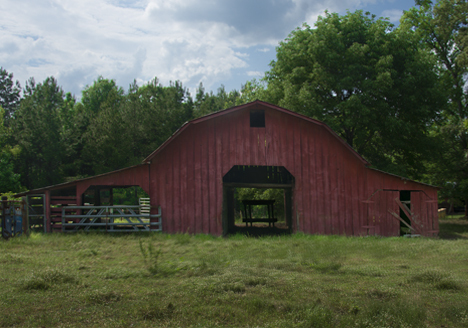 This red barn is just south of Hermitage, Arkansas on US Highway 63. As I was shooting, the owner drove up and gave me smiling dispensation to enter the barn premises, but by that time I was finished, so I thanked him and departed. On my recent trip to the Felsenthal Breamfest, I made some mental notes (some detractors may challenge that ability), about what to shoot on the way back. I call these “drive-by shots,” since I do not have to leave the beaten path to capture the image. The first of these was a functioning red barn with a little age, but much. The best evidence of a barn in use is meadow muffin presence — and this barn yard was well equipped. This hay field north of Warren, Arkansas invited me to shoot on the way to the Felsenthal Breamfest. I accepted the offer on the return trip. 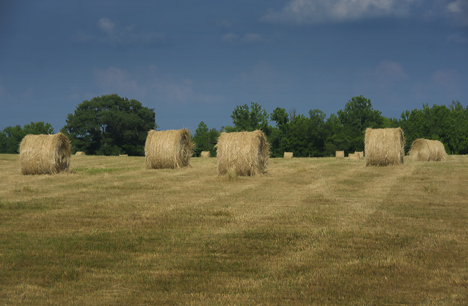 The second target was a field of round hay bales. Several years ago, shooting fields of round hay bales was all the rage, then for reasons unbeknown to me they fell from favor. I am making a meager attempt to rejuvenate the trend. Before we go much further, last weekend, I photographed a Memorial Day program. I went to shoot a flyover by the Black Pilots Association of America. I had intended to shoot the flyover and make tracks, but did a preference reset and stayed longer. To find out why, read my observations from the event and see a bunch of event pictures including the fire-belching cannon on the Photo of the Week page at Corndancer dot-com. We’ll wait here until you leave. Needing a few more images to round out a story, I sallied forth for more drive-by shots on my own turf, nearby LA (lower Arkansas). I was not dissapointed. Despite many trips, there is always something new or different. 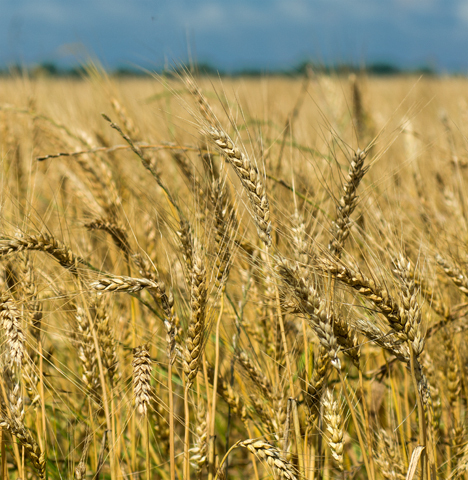 When most people think of big wheat fields, they think of the midwest. This wheat field is in LA, north of Pine Bluff, Arkansas and looks bigger than some towns. 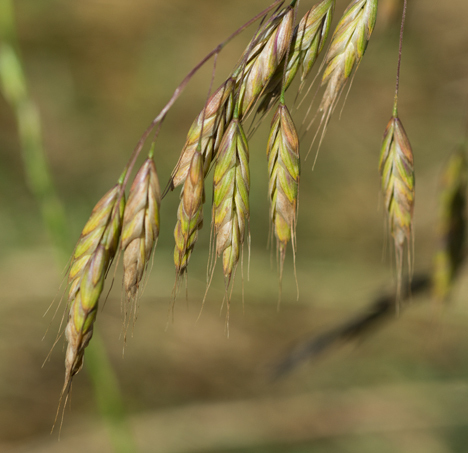 In the ditch beside the wheat field, I found this little “wheat wannabe” weed. I do not have a clue what it is. 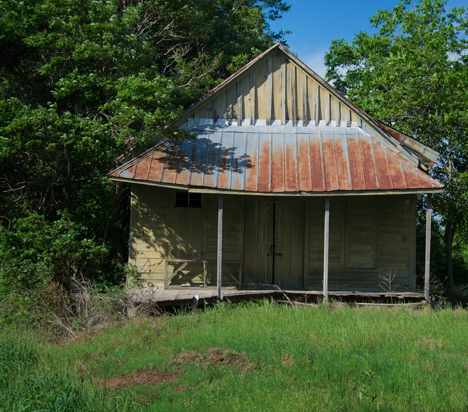 This old building on North McKinney Road, northwest of Sherrill, Arkansas is one of my favorite targets. It is hanging in there well. 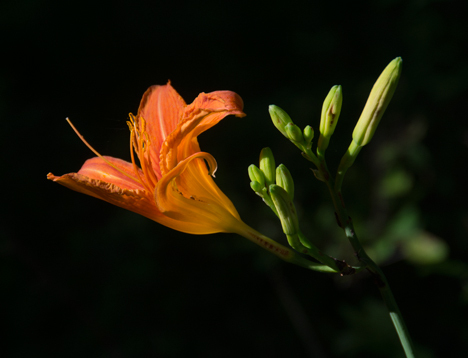 This lonely lily is a photographer’s dream. It is strongly lit from the front with a dark background on the side, Hallelujah! The next three pictures won’t mean much to non-LA readers other than visual interest. 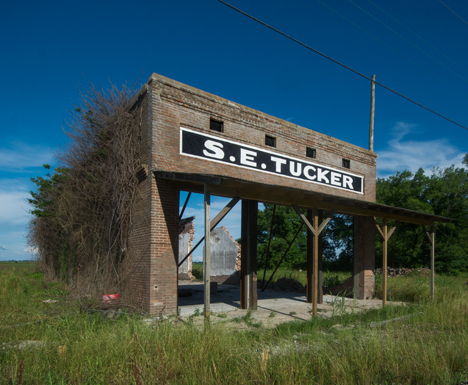 What’s left of the old store at Tucker, Arkansas still stands. All the debris has been cleaned up. A person or persons unknown to me have done some professional work to stabilize the structure, so what’s left may be with us for a while. Take a gander. The old store sports some new supports for the front porch, otherwise the porch roof would be hugging Mother Earth. View from Southwest to Northeast. 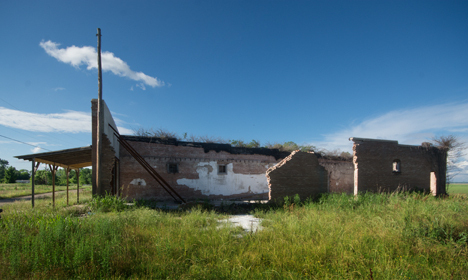 The old store seen from Northwest to Southeast. 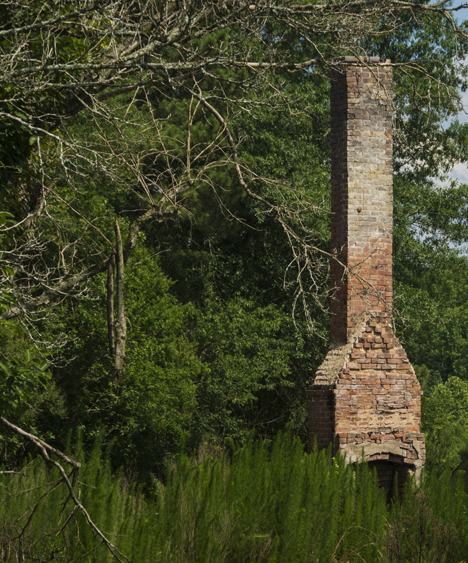 The clump of greenery to the right surrounds the old Tucker Plantation “Big House,” which is standing – with holes in the roof – which means it is on its last legs. Looking at the store from South to North. You can see the support in place to keep the front standing. Well folks, some of these epistles have a deeper meaning. This is not one of those. I hope you enjoyed the pictures and minimal verbiage.